L-R: Mrs. Marian Elorza, Secretary General for External Affairs of the Basque Government, Ambassador Carlos C. Salinas, Mrs. Isabelita T. Salina, Mr. Markel Olano, Congressman of Gipuzkoa, and Consul General Marciano de Borja. The Philippine Embassy in Madrid participated in a conference in commemoration of the 450th anniversary of the arrival in the Philippines of Miguel López de Legazpi and Fr. Andres de Urdaneta, held in Donostia, San Sebastian on 18 March 2016. The conference was co-organized by the Basque Government, the Regional Council of Gipuzcoa and the Philippine Honorary Consulate in Bilbao. It was held in San Sebastian for two main reasons: it is the European Capital of Culture for 2016, and, Legazpi and Urdaneta were born in Gipuzcoa. Consul General of Agana PCG, Mr. Marciano de Borja, presented his book “Basques in the Philippines” during the conference. Ambassador Salinas, in his intervention, paid homage to Miguel López de Legazpi, a Basque explorer who established the first Spanish settlement on the site of modern Cebu and Fr. Andres de Urdaneta, a Spanish priest who accompanied Legazpi on the said voyage. He noted that these explorers, together with the rest of their crews, “looked out into the horizon and felt no fear of the unknown, but the anticipation of being on the precipice of great change and the creation of a link between continents”. 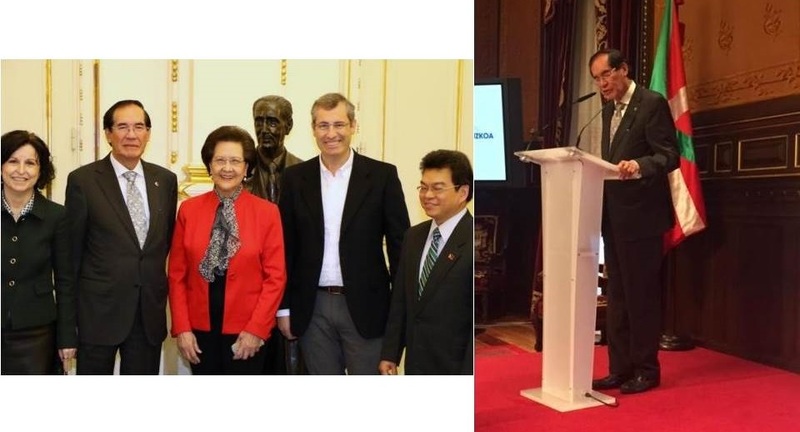 The said link and interconnection between the Philippines and Spain came to involve other countries, but the key engagement was between these two countries. The Pacific Ocean facilitated this engagement between the East and the West from the purely political plane to those of culture, economy, science and technology, and environment. Ambassador Salinas also underlined the importance of the blood compact between Legazpi and the Filipino chieftain Urrao, a gesture of friendship between the Philippines and Spain, which has grown stronger and deeper throughout the centuries.